Bathrooms are often a great source of joy and relaxation. When you are at home, very few experiences beat being able to sink into a hot bath, especially when you have had a hard day. While bathrooms are relaxing, they can often become hazardous. Not taking the right steps to make your bathroom safe for you or your child when you have a disability can lead to accidents. Fortunately, there are simple ways for preventing accidents in the bathroom. Mats are essential for children and adults alike. They can help you stay secure while in the shower and the bath, as well as when you are getting out. Using a fixed mat in either your shower or your bath can prevent you from slipping as you wash yourself, while having one placed anywhere in your bathroom where spillages are likely to occur resolves the same problem. One of the main concerns you may have about your bathroom is ease of use. A variety of devices are available to make your bathroom more accessible, including seats for your shower, baths you can sit in easily, and rails to manoeuvre while washing or using the toilet. However, you also need to consider product placement carefully. We all like to indulge in a little ‘me time’ while in the bathroom, as it helps us feel relaxed and makes personal hygiene enjoyable. A lot of this me time may revolve around using certain shampoos, washes, and scrubs, or maybe even scented oils and candles. Whatever it is that helps you feel relaxed in the bathroom, you need to make it accessible to prevent injuries. Such injuries can include strains from having to reach too far for an item. Accessorising your bathroom with baskets, hanging rails, and shower storage can prevent such injuries occurring. As well as limiting the risk of injuries, such accessories ensure you do not feel stressed while trying to relax. In addition, they act as a great opportunity to personalise your bathroom and add your own sense of style to it. When planning your bathroom to make it accessible, consider how you like to move around and what you may need to reach for. Investing a little time in making plans now can make life much easier in the future. Autism is a wide spectrum, which means the way your child responds to bath time may be entirely different to the way another parents’ child reacts. In some cases, children appreciate the sensory benefits. If your child feels calmer after a bath, consider the above tips regarding mats to prevent slips. In addition, always ensure the water is no deeper than it needs to be. This can prevent your child accidentally swallowing water, which may cause them to become upset. For other children, bath time is a chore. Finding ways to make the bathroom more comfortable for your child can prevent accidents. When you adapt your bathroom, introduce him or her to it and allow them to become involved with the process so it remains familiar. Consider buying a book about bath time and establishing some of their favourite toys in the room. An occupational therapist can help you decide if your bathroom requires modifications, if necessary. 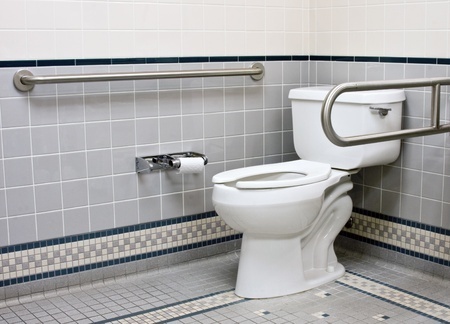 If you have a disability or care for someone who does, bathrooms can often present daunting challenges. However, they can also act as an area where you go to escape from day-to-day life and wind down at the end of a hard day. With modifications and your own personal touches, your bathroom can remain as a safe place of enjoyment, not one that is full of hazards. At Creative Living we are dedicated to providing quality bathroom, kitchen and home products to help our customers to live a more independent life. From height adjustable kitchen benches and basins to wet room solutions and walk in baths, there is something to suit every ability.